A long overdue Meatless Monday post. I bought this right before Easter at the India Bazaar, and I picked it up for a few reasons. 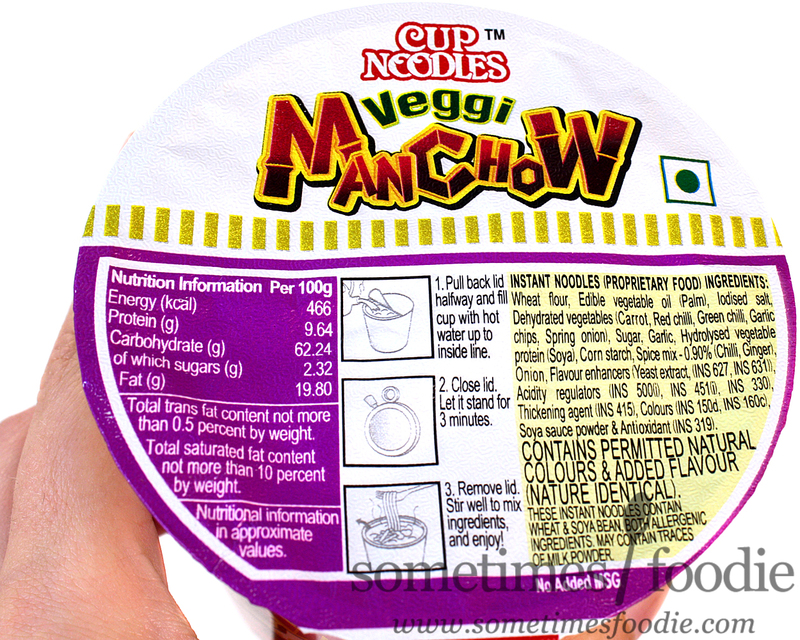 It's called Manchow, and I find that really funny, but it's a real soup. It's veggie-based, and I'm always looking for easy veggie meals. It's Manchester United Football Team themed! I don't follow sports, but I love movies, and whenever I see Manchester United, I think of the Soccer Hooligans from Eurotrip, which is a raunchy, but extremely underappreciated film that everyone (over the age of 18) should see at least once. Also, fun fact, when I was traveling through Eastern Europe I saw a sign for Bratislava and nearly jumped off the bus to take a photo. Before I go off on a tangent about my love for Eurotrip, let's cook up some cup noodles! 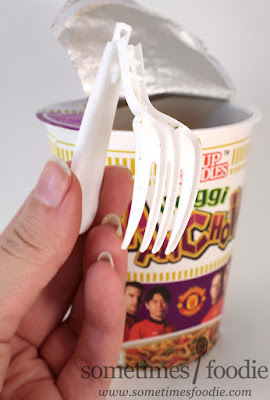 Once I got over my tiny folding fork obsession, I took a closer look inside the cup. That's a lot of dried peppers and seasoning. 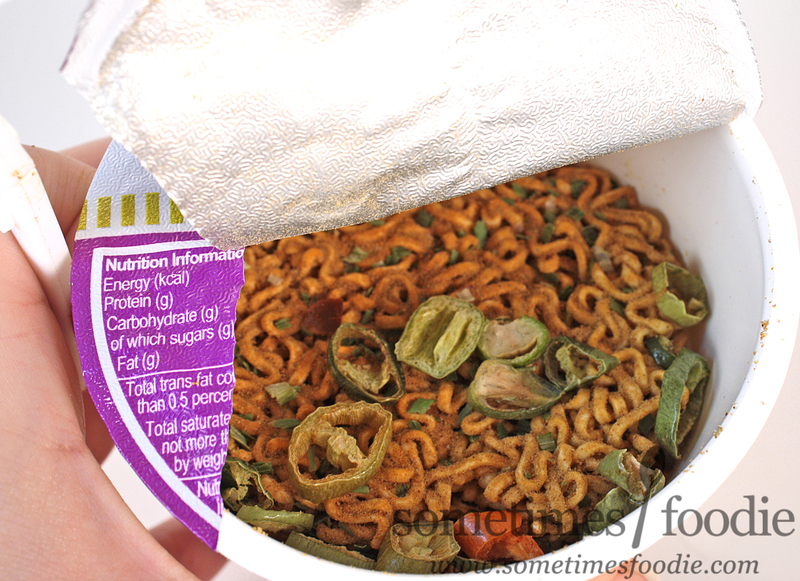 I'm thinking this instant noodle cup is going to pack quite the punch. I warmed up my electric kettle, poured some hot water inside, waited a few minutes, and it was ready to eat! Oh, wow! This is way tastier than I'd expected. The seasoning and dried peppers on the surface created a really flavorful, spicy, broth, and the other veggie mix-ins re-hydrated nicely to add a bit of texture to this otherwise soft noodle dish. 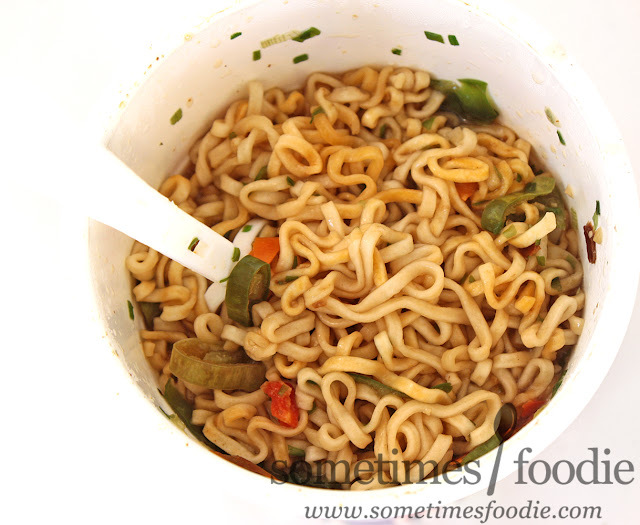 The overall flavoring is very salty, like most instant noodles, but there is a fair amount of pepper (the vegetable) flavoring as well as garlic, onion and maybe jalapeno pepper? The spice level is no joke either. For me, I'd gauge this at medium-high to hot heat-level. It won't send anyone running for a glass of milk, but it's far from wimpy. If you can't handle medium salsa, this isn't for you. The spiciness builds as you eat and towards the end I felt my nose burning and I broke out into a light sweat, which is always a sign that spicy food is GOOD. 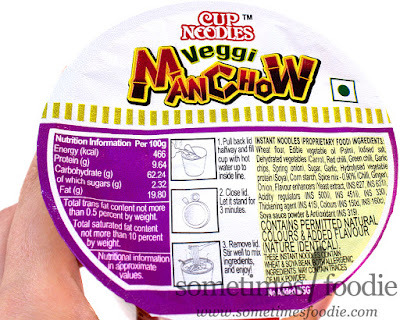 It's still cup-noodles, so it's not like this will be passing as gourmet cuisine any time soon, but as far as cup-products go, this is one of the tastiest I've come across. I really loved the heat level, and my sister really liked it too. 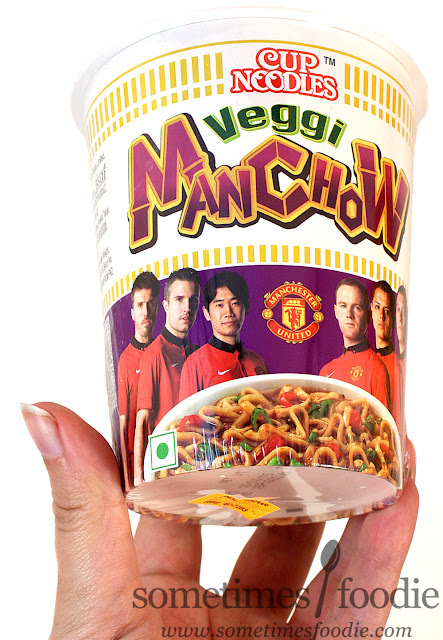 Even if future cups didn't feature the Manchester United team, I'd still buy this again in the future. Spicy ramen and noodle lovers should keep an eye out for this one. Looks and sounds delicious! Can't wait to try this one and share it to my wife. englishessays will not allow such review, because they lack skills.